Lady Uddin was raised to the peerage as Baroness Uddin, of Bethnal Green in the London Borough of Tower Hamlets in 1998. She is not affiliated with any group or party. Lady Uddin was born in 1959 and came over from Bangladesh in 1973. She was educated in the University of North London, where she earned her diplomacy in social work. Uddin started her professional career by creating and leading community working groups. In 1980, she started working as a Youth and Community worker with the YWCA, and then a Liaison Officer for Tower Hamlets Social Services, and Manager of Tower Hamlets Women's Health Project. 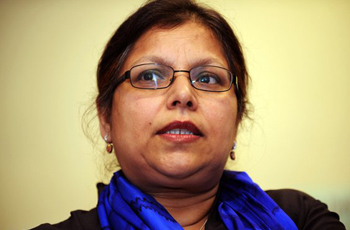 In 1990, she was elected a Labour Councillor in the London Borough of Tower Hamlets; the first Bangladeshi Woman to hold such an office of a local authority in the UK. Since entering the House of Lords, Baroness Uddin continues to champion a range of initiatives and organizations which promote women's participation in civil society, violence against women and human rights, in the UK and internationally with a number of governments in the Muslim world. She is a passionate promoter of diplomacy and conflict resolution, having travelled extensively to a number of Middle East and European countries on bridge-building missions. Baroness Uddin is a patron of several organisations including Orbis International, Student Partnership Worldwide, Bethnal Green and Victoria Park Housing Association, and many more, and was also awarded an honorary doctorate from Exeter University in 2004. She is married with four sons and one daughter.